Hobbyists are known for not leaving well enough alone. Usually that's a good thing because many innovations and improvements in existing technology can be attributed to them. That goes for aerodynamics, electronics, biology (gardening), chemistry (paints and adhesives), automobiles, and many other realms. In this case, the venerable Jetex 50B has had its thrust level amped by a factor of 6 simply by drilling a hole through the center of the fuel pellets and using variations on how to arrange the wick and screen inside the engine. Then, the thrust increase was so great that it required replacing the single-spring retainer for the nozzle with a double spring version. It was also necessary to replace the original aluminum body with a steel body to handle the increased heat levels. Other than size and shape, the 50-HT (High Thrust) is really a whole new engine. Here is more information on the Jetex series of motors. Look what they did to the small, once lady-like Jetex engine! It's been souped up into a real Tiger-type go-go-go-man miniature rocket plant. More than six times as powerful as the standard 50B, the new Jetex "50- HT" high-thrust reaction engine makes possible vastly improved model air­planes, missiles and even rocket-type boats and cars. The earlier 50B developed a 3/4 ounce thrust; the 50-HT by American Telasco offers five ounces. The latter can lift vertically a 3-ounce machine with enough power surplus for eye-opening acceleration. The lighter the model, of course, the more spectacular the acceler­ation and over-all performance. Competition model aircraft should show tremendous improvement in duration. 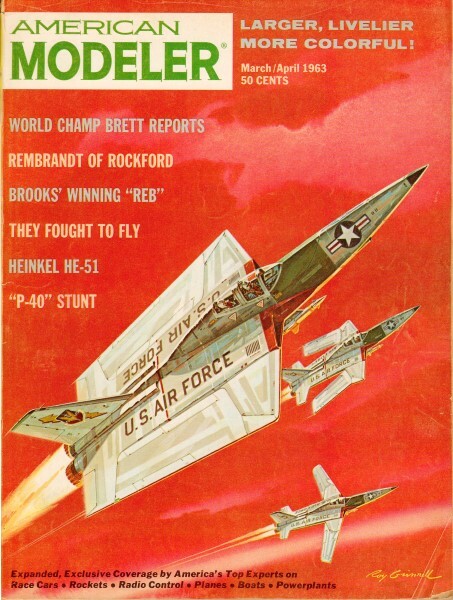 Scale jobs such as the Lockheed F-104 and the X-15 are feasible. Engine and fuel have undergone some changes, A 1/8-inch diameter hole drilled through the fuel pellet is a "trick" borrowed from full-scale solid-fuel makers. They found hollow charges greatly improved thrust figures. 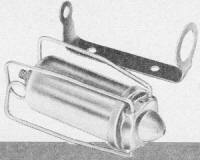 The 50B single-spring motor should not be used with the potent 50-HT fuel. For the new fuel a double-spring chamber-sealer is combined with a steel-barreled chamber. Despite greater thrust and heat, the new pellet bums cleaner and reduces maintenance. By combining a high acceleration 50-HT charge with one of the lower-thrust 50B charges for sustained duration, resourceful designers can work out many combinations. Additional variations can come from different fusing arrangements now possible with the drilled charges. To evaluate basic combinations in terms of performance we have prepared a series of graphs which reveal the thrust in ounces as related to time. "Time is in seconds at the top of each graph; thrust in ounces is at the left. 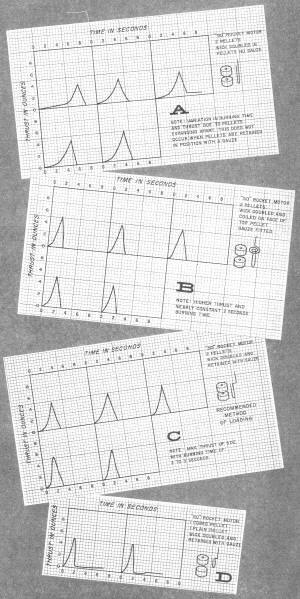 Labeled A, B, C, and D, these graphs show test readings for successive trials under varying conditions. When using the recommended method of loading-see Graph C-wick doubled in the pellets and retained with gauze, a maximum thrust of five ounces can be anticipated with a burning time of two to three seconds (although two firings lasted four seconds and one went 3-1/2 seconds). What happens if the gauze is left out? Both thrust and burning time vary widely, with peak thrust being reached more slowly and the run lasting longer but with thrust falling off (Graph A). If you want more thrust at the cost of reduced burning time, the wick can be doubled and coiled on the face of the top pellet, with gauze fitted. 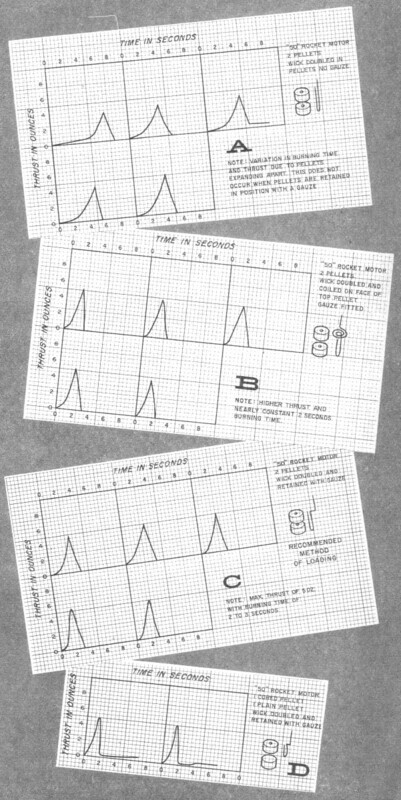 Peak thrust in this case is reached in a nearly constant two seconds (Graph B). By combining one cord and one plain pellet (Graph D) with wick doubled and retained with gauze, the peak thrust is reached in about 1-1/2 seconds with the sustainer effect of the plain charge extending the total burning time or motor run to about seven seconds. What effect will the 50-HT have on model design? To handle the high thrust, it is probable that longer moment arms and higher thrust lines will be employed, just as, they were in free flight gas. Wing sections will be thinner and more double-surfaced wings should be seen. Structures will be sturdier. Who really can predict what ingenious modelers will do with a 600% increase in thrust? American Telasc6's 50-HT should stir things up a bit.